Summit DD Service and Support Administrators, or SSAs, coordinate and connect people with developmental disabilities to individualized supports. Our SSAs develop individual service plans, or ISPs, that connect citizens with disabilities and their families to providers within the community that can help you achieve your vision of a happy, satisfying life. You always have the right to choose an SSA that best suits your needs and service coordination is provided to individuals who are eligible for services at no cost. Summit DD SSAs coordinate services and connect people with developmental disabilities to individualized supports, whether they are provided by Summit DD or a private service provider. 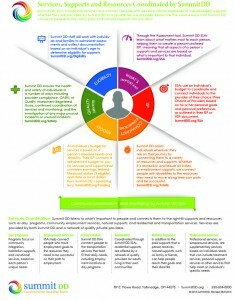 Download your service coordination infographic. Download a copy of our Service Coordination Guide. Ready to start your individual service plan? Contact us to get started. Service Coordination: SSA or RSS? Where do our tax dollars go? A handy guide.